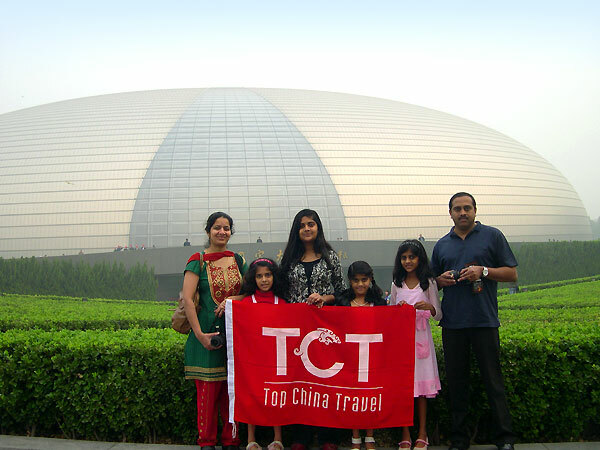 This tour includes three tour spots, Mutianyu Great Wall, Lama Temple, and Sanlitun. In the early morning, you go to Mutianyu Great Wall, then go to Lama Temple in the afternoon, and last go to Sanlitun in the nightfall. Mutianyu Great wall, is located at Hairou district, 73 kilometers away from Beijing downtown. Mutianyu Great wall has a length of 5,400 meters, reputed as the longest section of the Great Wall, east to Gubeikou and west to Juyongguan. It is built in 1368 as an important military defensive project, and has many military constructions like watch towers, smoke towers, passes and walls. For more information about Mutianyu Great Wall, please visit Mutianyu Great Wall. 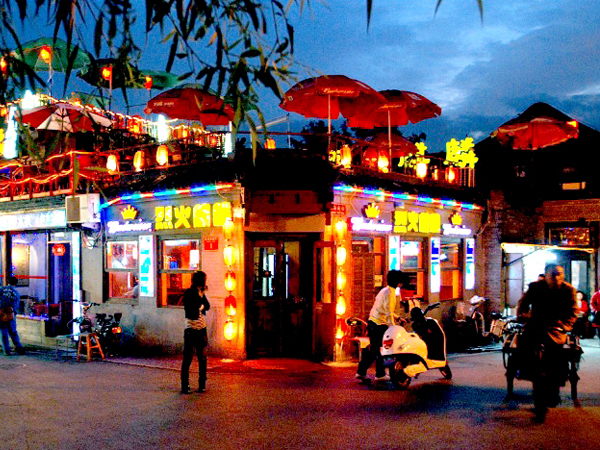 At the foot of the Mutianyu Great Wall, there are many restaurants, café, teahouse, and beer bar for you. You shouldn’t worry about food and drinks. Please plan your climbing route well. Mutianyu Great Wall has 25 watch towers stretching from east to west, and several entrances. Through these entrances, you may begin your climbing from No. 10 watch tower, No. 8 watch tower, No. 6 watch tower, No. 14 watch tower. Cable car will bring you to No. 14 watch tower, and Pulley car will bring you to No. 6 watch tower. You may first climb the Great Wall, and go down by cable car or pulley car. Or you may go to No. 6 watch tower by pulley car, and go to No.1 watch tower, then turn back and climb all the way to No. 20 watch tower. In the end you turn back to No.14 watch tower and take a cable car to go down. Public bus: Take No. 916 fast public bus, at Dongzhimen bus station(东直门), and get off at Huairou beidajie bus stop(怀柔北大街) or Huairou bus station(怀柔汽车站), then take a taxi or charter a car to Mutianyu Great Wall. No.916 fast public bus from Dongzhimen bus stop to Huairou bus station, starts at 05:50 o’clock, and every 20 minutes, and ends at 19:50, while No.916 fast public bus from Huairou bus station to Dongzhimen bus stop, starts at 4:50 o’clock, and every 20 minutes, and ends at 18:50, and the ticket fare is up to your journey distance, and the up-limit is 12 yuan for a single trip. You may take subway line 2 to Dongzhimen subway station, and then go to Dongzhimen bus station. Take a taxi: take a taxi with other tourists who also go to Mutianyu Great Wall, and it is a bit expensive but convenient. Taxi fare is calculated in this way since 2017: within 3 kilometers 13 yuan +1 yuan (fuel surcharge). More than 3 kilometers: 13yuan (within 3 kilometers) +1 yuan (fuel surcharge)+2.3×kilometers(deducting 3 kilometers). If you take a taxi in the time period of 23:00-5:00, 20% will be added to the unit price, and 2.3 yuan per km, would be changed to 2.76 yuan per km. This information is only for your reference, which may be different according to price adjustment. Chartering a car: the fare is your deal with the driver. Shuttle bus: take a shuttle bus from ticket office to ticket entrance. Ticket fare for a single trip is 10 yuan/ person, and the round trip costs 15 yuan/ person. Walking: walking in the whole journey is recommended to tourists with vigor and in good condition. Cable car: its opening hours are from 8:00-17:00 in summer, and from 8:30-16:30 in winter. A single trip for an adult costs 100 yuan, a round trip for an adult costs 120 yuan, and Children enjoy half price. Pulley car: its opening hours are from 8:00-16:50 from Monday to Friday, and from 8:00-17:00 in Saturday and Sunday. A single trip for an adult costs 100 yuan, a round trip for an adult costs 120 yuan, and a round trip for a child costs 60 yuan. 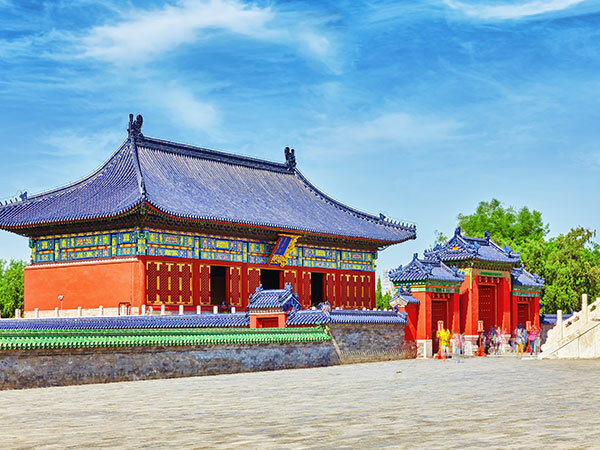 Zhengguan tai, built in 1404, is a strategic place for generals to make meetings and make commands, and it is also used to house soldiers and store food. Waizhcheng is a military construction composed of a wall and a watch tower. It has two storeys, with a height of 10 meters. Iron cannon is 89 centimeters long, with a 9 centimeter caliber, and it can load about 2 kg dynamite with a cannon-shot of 150 meters. An old pine is standing here together with the Great wall, with an age of over 300 years, and its branches are unfolding like a welcome gesture. You can also see Qi Jiguang Statue, who is a great general in ancient China, and leads soldiers to build a section of the Great wall with a length of 2 kilometers. After a tour of Mutianyu Great wall, you go back to downtown by bus, which could take about 2 hours. Then you may take subway or public bus to the Lama Temple. Lama Temple, also known as Yonghe Palace ( 雍和宫: Yonghe Gong), located in the northeast of Beijing, is first built in 1694 as the residence of a prince. In 1725, it is rebuilt to a palace, and in 1744, it was made as the Lama Temple, which is the best Buddhist temple in term of its construction. It covers an area of 6.6 hectares, with 661 rooms, and its building style is a combination of several nationalities like the Han, Man and Mongolian. The main buildings of the Lama Temple consist of three exquisite archways, and several palace halls and two exhibition halls. Those palace halls are Yonghemen Hall, Yonghegong Hall, Yongyou Hall, Falun Hall, Wanfu Hall, Suicheng Hall,etc., and all of them are laid in the central axis. The Lama Temple houses enormous Buddha statues, Tangka, and lots of documents and articles. Among them, there are many treasures like the three treasures of woodcarving, a statue of Sumeru, and three bronze statues of Buddha. For more information about the Lama Temple, please visit Yonghe Palace. Tour guide: it has tour guides offering language service of Chinese, English, German, French and Japanese. The fare of tour guide service: 200 for a group of 1-3 persons, 300 yuan for a group of 4-6 persons, 400 yuan for a group of 7-10 persons. The time of tour guide service is about 45 minutes. No photos. Inside these Halls, please remember do not take photos. Incense sticks. If you like to burn some incense sticks, three incense sticks are good. Pubic bus: take No. 13, No. 684 public bus and get off at Guozijian bus stop. Take No. 116 or No. 117 public bus and get off at Yonghegong bus stop. Take No. 18, No.62, No. 606, No. 909, No.44, No. 800, No. 858 and get off at Yonghegong qiaodong bus stop. When you get back to Dongzhimen from Miantianyu Great Wall, you may take subway Line 2 at Dongzhimen subway station, and get off at the next station, Yonghegong station, and walk about 150 meters to the Lama Temple. Or you may take No. 117 public bus and get off at Yonghegong bus stop. First come to the front gate, three archways, which are decorated with patterns like dragon, and the middle archway has a board reading “ shidi yuantong” which refers to Bodhisatva. Through the archways, cross a court, you come to Yonghemen, also known as Tianwang Hall. In front of this hall, there are bronze statutes of lions. Inside the hall, there is a throne with dragon carving and gold varnish, and a statue of Maitreya sitting on the throne. In the two sides of the hall stands four painted sculptures of four Tianwangs who are gardians. Behind Yonghemen is Yonghegong Hall, which has three bronze statutes of Buddha, with a height of near 2 meters in the middle. In east and west sides, there are 18 statues of Luohan. After Yonghegong Hall, you come to Yongyou Hall which has a lotus throne with a woodcarving of three statues of Buhhda, 26 meters high. Then you go to Falun Hall. In this hall, you can see a bronze statue of Tsongkhapa, 6.1 meters hight, sitting on a lotus throne. Behind Tsongkhapa statue is Wubai luohan shan, which is a woodcarving made from padauk, about 5 meters high, 3.5 meters long and ,0.3 meters thick. The woodcarving has 500 small Buddha statues in various shapes, and casted from gold, silver, bronze, iron and tin. Next, you come to Wanfu ge, which has three layers of eave, with a height of 25 meters. Inside the hall stands a huge statute of Maitreya, carved from white sandalwood, with a height 18 meters and a width of 8 meters. The East Side Hall has a shrine carved with 99 dragons, and the shrine is carved from phoebe nanmu. In the north end is Suicheng Hall. After a tour in the Lama Temple, you have enough times for shopping and stroll. Then I recommend you go to Sanlitun. Take No. 117 public bus or Ye 6 public bus from Yonghegong bus stop and get off at Gongren tiyuguan bus stop and walk about 150 meters to Sanlitun. In Sanlitun, you could go shopping in large shopping malls, and buy some clothes or other things before nightfall. When night falls, this place becomes pretty busy and crowded, and you may taste Beijing food and snacks in here, you may go to the bar street to have drinks, and enjoy your nightlife in Beijing.